CYB PLC which are the UK retail banking assets spun out of National Australia Bank (NAB) remains a compelling short, medium and long-term investment in my opinion. 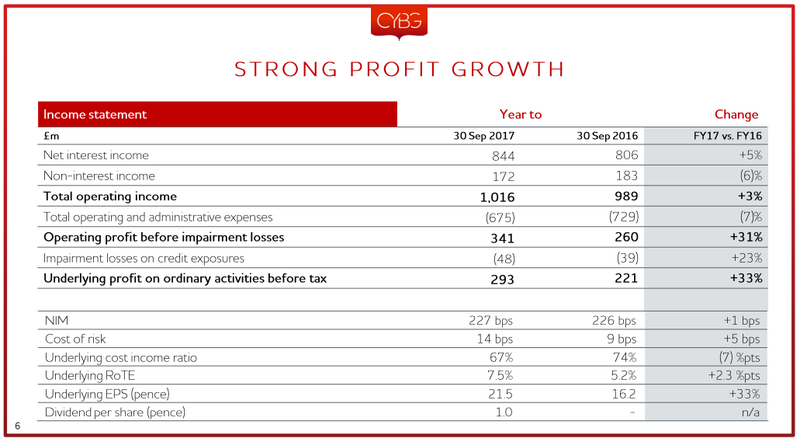 Last week CYB reported full year profits that were better than expected and announced an unexpected dividend. The AIM Global High Conviction Fund increased its exposure to CYB, through the ASX listing (CYB) and we continue to believe further significant capital gains are ahead for the stock. I saw CYB CEO David Duffy present and the Merrill Lynch Global Financials CEO Conference in London in September. I thought he gave an excellent presentation and appeared very confident. Fast forward to today and the conviction we got from seeing Duffy present has been vindicated. That said, despite CYB shares making fresh highs, we think there’s more to come here and CYB remains a high conviction investment for us. At the macro level we now have a confirmed Royal Commission into Australian Banks. 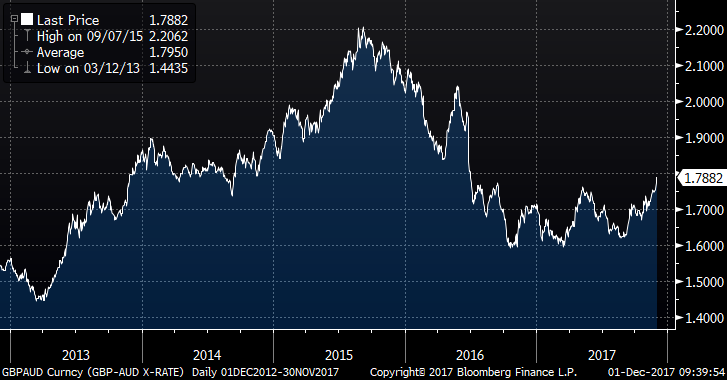 That leads to 12 months of uncertainty for large cap Australian Banks. CYB is a UK bank that just happens to be listed on the ASX due to its previous ownership by NAB. We see regulatory risk tailwinds for CYB vs headwinds for the big 4 Australian banks. Spin-offs from large companies usually prove good investments. They are usually spun off out of frustration by the larger company and usually at what proves a bargain basement valuation. The large company board usually cheers the disposal of the smaller “problem asset” but more often than not the spin off goes on the hugely outperform the larger mother ship due mainly to being freed from the bureaucracy of the larger company. CYB is a classic example and will continue to deliver much stronger returns than the NAB mothership. 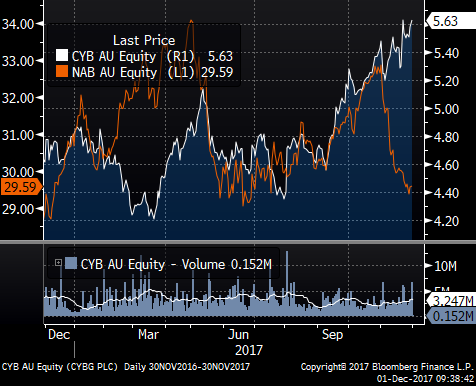 The chart below is a simple overlay of CYB vs NAB over the last 12 months. Spin-offs usually emerge with solid and incentivised management teams. They are usually also under-geared. 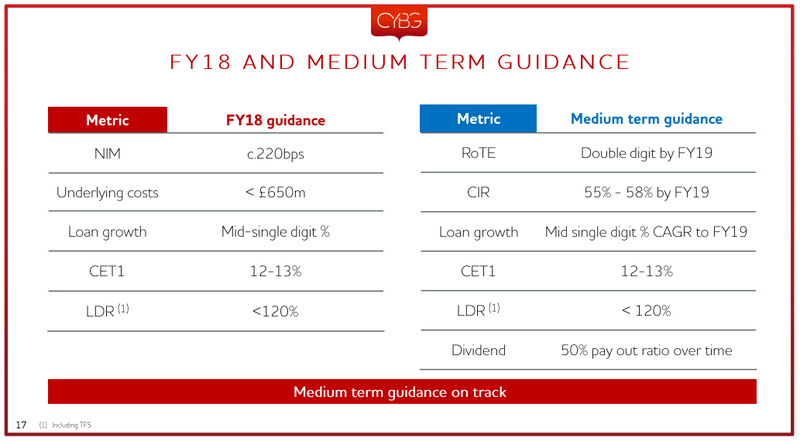 In the CYB case we think the management team is well above the quality usually associated with a regional bank and the balance sheet, in terms of tier 1 capital, is over-capitalised (in other words under-geared). CYB offers the combination of +25% CAGR over the next two years and will also have the high quality problem of high levels of excess capital. That excess capital will either be returned to shareholders or used to fund acquisitions, or a more likely a combination of both. This is the complete opposite of Australian banks who lack growth and still have less capital than required. 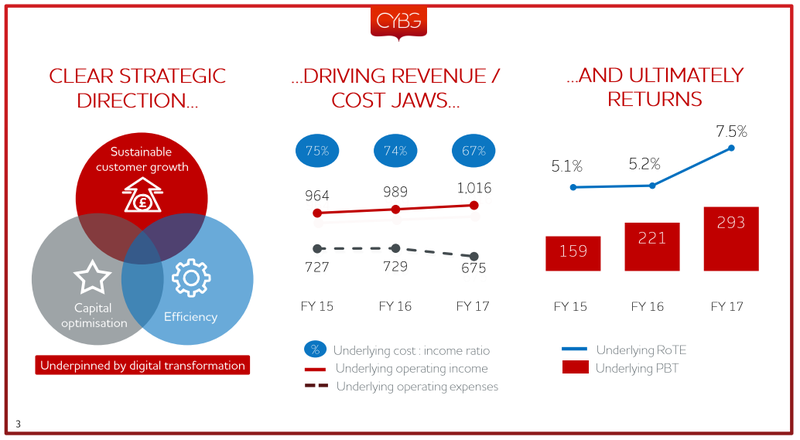 CYB’s FY17 result was solid, better than expectations and led to consensus upgrades to FY18 estimates. In the table below you can see net interest income rose +5% which alongside strong cost reductions drove underlying profit +33% and resulted in a 1p dividend ahead of forecasts. This was CYB’s first statutory profit in 5 years and a very good start as an independent company. CYB still has a very high cost to income ratio which is one of its medium-term attractions. 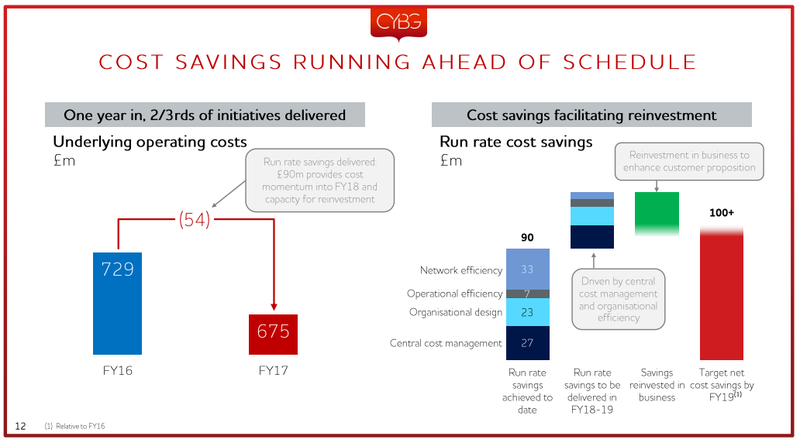 We believe CYB management will continue to reap cost savings ahead of conservative analyst forecasts. That is what occurred in FY17 and we expect more of the same in FY18 driven by legacy branch closures. The CYB fundamentals are compelling. Below are forecasts from Shaw & Partners for the ASX listed version of CYB which are relevant to Australian based investors reading these notes. You can see they forecast strong EPS growth in FY18 and FY19, with dividends also growing strongly off a low base. In FY19 they forecast a 5.4% dividend yield which would attract Australian investors. ROE is rising and price to book remains low. On a basic price to growth ratio CYB is cheap, very cheap for the next two years at least. The average PEG ratio for the next two years (estimates) is just .42x. Final attraction of CYB.ASX is the GBP/AUD cross rate. CYBG is a UK bank listed in the UK and the direction of the British Pound vs. the Australian Dollar does affect the pricing of the ASX listed version CYB. We believe the GBP/AUD cross rate has bottomed and has further upside in favour of the British Pound in the months ahead. The Bank of England recently raised cash rates while the RBA seems to be signalling no move in cash rates in the foreseeable future. Also, the UK and EU appear to be headed towards agreement on the cost of Brexit. We see GBP/AUD heading to 1.85 from 1.79 which would help CYB translation on the ASX. All in all CYB remains a high conviction buy. Offering double digit EPS growth, the likelihood of capital returns and dividends, yet still trading below tangible book value, the stock remains cheap on all investment metrics. I also like the fact that analysts in the UK are broadly cautious on the stock, with 1 buy, 6 holds and 9 sell recommendations. Those views will turn positive over the next few years as analysts chase the share price higher. 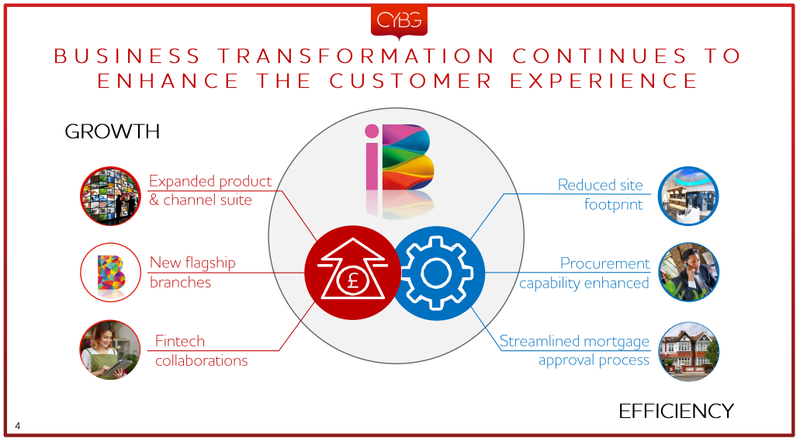 The CYB management team is delivering on this spin-off turnaround. We see CYB as potentially A$7.00 over the medium-term and it is the AIM Global High Conviction Funds largest global bank holding. It is a classic top down meets bottom up story, yet it remains cheap. For more information on Aitken Investment Management please visit our website.